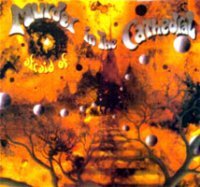 Murder In The Cathedral is a french band that plays guitar driven acid-rock that struck me as a cross between Bevis Frond, Cream and Jefferson Airplane. The music has a great raw jamming sound that will transport you back to the Fillmore of 1968. The band is a trio (though there is a lot of dual guitar) and includes Stephane Moru on guitars and vocals, Pascal Moru on bass and keyboards, and Gilles Lepron on drums. “Afraid of…” is a limited edition of 500 LP’s and features vocal tunes and instrumentals all ranging from three to five minutes. This is the band’s second album. Both the vocal tunes and the instrumentals really work for me on this disc as many of the vocal tunes include fiery instrumental sections. Songs like “Nervous breakdown”, “Dead pictures”, “Message from the sun”, and “Lost love” have that 60′s San Francisco acid rock feel that also reminds me Bevis Frond. Stephane’s guitar is fiery but in that raw style that made 60′s psych sound and feel so good. “Bed of roses” is a little different, sounding very much like the Byrds. But “War games” is my favorite of the vocal tracks. It has that epic quality, kind of like an anthem, and some great guitar that trip along with the music. The band explores the paisley spectrum even further on their instrumental tracks. “Acid sea” has a guitar melody that is cosmically floating but still raw. The music is like a magestic overture that doesn’t just jam but really develops. I would have liked to see it evolve beyond its four minutes. “Pagan mass” is a tripped out psych tune that will transport you to the bazaars of the ancient Middle East with guitar solos and tribal percussion that journey deep into the cosmos. “Chaotic meditations” is melodic in an acid drenched way and loaded with wah-wah. Like “Acid sea” this track has more thematic developpement than the others and is less raw bordering more on instrumental complexity, though firmly in the psychedelic realm. In summery, Murder In The Cathedral contains some gorgeous psychedelia for those who like raw jamming psych from musicians who can actually play. Vinyl junkies beware, this is the 2nd release from french band Murder in the Cathedral, their first is sold out, so I wouldn’t hang around on this one either. Only 500 copies have been pressed on 190gm vinyl with stunning psyched out color sleeve design. The music is very much fixed into the tradition of the US west coast sound of the late sixties. Some of the guitar work is amazing esp. on track 2 Acid Sea and track 9, God above Suspictione. The band pull no punches going straight into what they want from their music, quoting bands of such caliber as Quicksilver and Plastic cloud as influences, they claim the baton for 90′s ACID ROCK. Not so much a retro sound as a reinvention of the sound of thirty years ago. If you are lover of the late sixties where the post psychedelic pop bands hadn’t quite made the progressive sound yet, then I’d recommend a trip to Murder’s web site, sounds samples and ordering details are on-line. Life is full of surprises: a psychedelic band from Vire (eastern Brittany, near Rennes), a trio who recorded a complete album at home on their 8 tracks equipment. Gilles Lepron (drums), Stephane Moru (vocal, guitar, keyboards) and Pascal Moru (bass, keyboards) canned a complete LP of excellent acoustic and psychedelic quality. Their music sound much inspired by early 70s british guitar psych bands like Clear Blue Sky, T2, Wishbone Ash or even Man resulting in 8 lenghthy pieces mostly filled with flowing and warped guitar lines, floydian keys and semi mediaeval atmospheres. A fine and beautiful album, pretty authentically “british” sounding in music and vocals! Recommended LP that will predictably turn into a collector’s item soon enough.